How many times have we been told to unite our work with prayer, to raise it up and sanctify it by prayer? Such frequent reminders flow from the real need and difficulty of safeguarding our interior life in the rush of work; we are frightened by this invasion, by the overwhelming nature of the work that is keeping us away from God. We long to preserve our spiritual life by permeating our work with prayer. This thought is expressed in the maxim “Pray and work!” But this is a difficult thing to accomplish. For conscientiousness in work and the turning of our attention to God are at odds with one an­other. When we are fully absorbed in our work, we forget about everything, about the whole external world, and all the more about prayer. Prayer in work, however, is not a kind of small change; it is not a half measure in the solution of this conflict, nor is it merely a supplement to work. Is it not a part of asceticism? Is it not true that prayer in work has a prominent place in the rules of contemplative orders and, at the present time, in the constitution of almost every religious society? This problem is especially timely. For the amount of external work is continually increasing. Our environment makes increasing demands on our services, human needs grow, and the love of one’s neighbor, which, despite the evil in the world, is visibly spreading, draws us toward other people and encourages us to help them in their troubles. 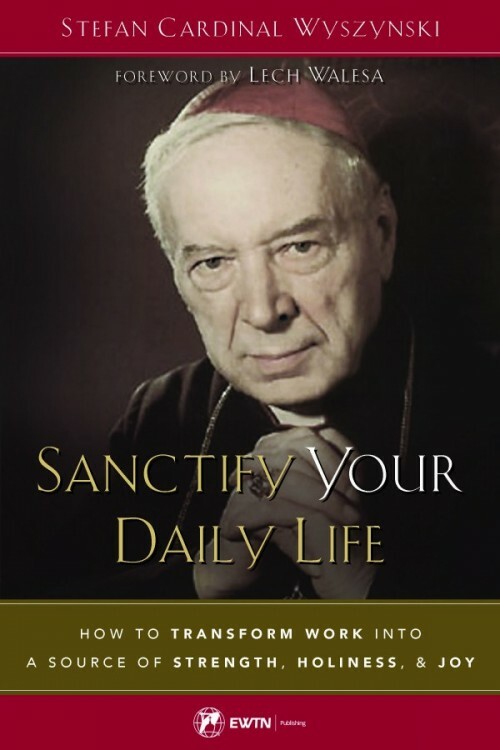 This article is a preview from Cardinal Wyszynski’s Sanctify Your Daily Life. Click image to learn more. As a result, the scale of both work and service is steadily increasing. In the life of our monasteries, the amount of time devoted to prayer in choir is being cut down all the time. And here the conflict arises: prayer or the service of one’s neighbors? Common prayer is being increasingly relegated to the sphere of private prayer; it is becoming a personal duty, although, fortunately, it is not growing less. But it is also getting harder to reconcile our other numerous duties with that of prayer, for which there is ever less room in the order of the day. Although we all long for this “better part” (Luke 10:42), we must yet concern ourselves with, and work at, many different things, as if we always had before us the image of the Last Judgment, when we shall be told, “When you did it to one of the least of my brethren, you did it to me” (Matt. 25:40). We insure ourselves against the future judgment of God, but also against the judgment of the world: we feed the hungry, give drink to the thirsty, clothe the naked, and accept the homeless into our own homes. But how does one reconcile social duties with one’s interior life? Prayer continues to be the greatest need of our soul, the most wonderful agent of sanctification, and the best way of adoring God. It must therefore continue to occupy its proper place; we cannot lose any part of it, in spite of the increasing deluge of work. We must, then, transfer it to the field of our work; it must “come out of the chapel” and go with us to our daily occupations. And this is necessary for another reason: because our life is becoming increasingly disintegrated, because we are caught up in the condition of our work, which is full of effort and haste, and because we are surrounded by the bustle of the street, the courtyard, the school corridor, the boarding school, the hostel, and the soup kitchen. All that the day brings us has to be balanced by prayer, so that all this confusion will not be transferred to our souls and so that we may sanctify our work by prayer, and specifically by prayer in our work. That is the problem! To solve it, let us recall those points of departure that we have already established for our problem. The first is that our work is cooperation with God. Every activity brings us directly back to God’s activity. And this is what is common both to work and to prayer, in which we also meet God. Furthermore, to work is to enter into God’s work, into the work of His creation. We are led into the center of God’s life. And this does not take us out of the environment that surrounded us at prayer, for there also we entered into God’s work, although it was of a different kind. Still, work is recognition of God in His works. By recognition, love multiplies in us, and that is why work is love. Do not the two meet in prayer? Work and prayer are not alien to one another, therefore, even at the outset. In fact, prayer in work will only be a conclusion drawn from these truths; it will be both the necessity of work and at the same time its joy. If work leads to the love of God and one’s neighbors, there are certain obvious consequences. The first consequence is that if we love God in work, it is impossible not to tell Him so. It is hard to practice love in the silence of one’s heart and thoughts. We cannot keep it a secret from God. Love must have its great avowal. And what is such an avowal but prayer? From this prayer the soul rises up in song: “All ye works of the Lord, bless the Lord” (Ps. 144:10) — all the works, and therefore, those also that are born of the work of human hands and brains. The third consequence is that if we love God, interiorly we want to submit our life to Him completely. We want to do what He has in mind, to seek what He seeks, to perform what He wants, to feel oneself part of His plan and intention, to subordinate fully one’s thoughts, feelings, strength, and human will to the commands of His will, and to act as He wishes! This, indeed, forms us inwardly in the image of God’s activity to the fullest extent possible. Finally, the fourth consequence is that if we love God, we wish to have the same intention in our work as He has. To God’s summons to “subdue the earth” (Gen. 1:28), we reply, “Not mine, but Thy will be done” (Luke 22:42). This intention of our work becomes its moral core. It gives to it its supernatural value. By our intentions, we sanctify our ordinary, everyday activities. “Whatsoever you do, do it from the heart, as to the Lord, and not to men” (Col. 3:23). Prayer is a necessity of work, because work is love for people as well as for God. But there cannot be love for God without prayer. From this it follows that every loving work is prayer. The lack of prayer during work is a mistake that can be made in any activity. The greater the love we have for God, the more spontaneous prayer in work becomes. It is not necessary to look for it, to be encouraged to practice it, or to be reminded of it. As love increases in us, so the relation between every external action and the interior life is also increased. To some extent the consciousness of external action fades away and only the consciousness of prayer through work remains. So, in fact, to raise the level of love in work means to raise the level of prayer. For love completely envelops everything about us, and embraces our whole life, including all our actions and activities. Nothing escapes its embraces, for through love we become one with God, and, through prayer, everything that is “ours” becomes God’s. “For all are yours . . . and you are Christ’s, and Christ is God’s” (1 Cor. 3:22-23). The necessity of prayer in work is linked with the consciousness of our insufficiency, with the toil and hardship of work. Without God we can do nothing — nothing either in the spiritual life or in the sphere of simple activity. God is the prime mover of every intention and act. From this comes our humility. We also know that “all our ability comes from God” (cf. Rom. 13:1). We also know that “nothing is beyond my powers thanks to the strength that God gives me” (Phil. 4:13). Faced by difficult tasks, when strength, merits, virtues, skill, and will are lacking, we are conscious of our resistance, grief, fatigue, and the deluge of work. The acceptance of this burden and the offering of it to God imposes itself on us like a joyful necessity. And again prayer becomes the intermediary. Simple working people have a habit of beginning every task, which will be more than ordinarily difficult, with a prayer. The farmer still kneels today on the ridge before he begins sowing; he makes the Sign of the Cross with the scythe before he begins to mow. The universal custom of the consecration of our fields of activity and our home is a distant echo of the living faith in the help of God. For all those spiritual powers of ours that play a part in work are set in order by prayer. The mind embraces God’s light. We know this fact well from more than mental work; the will, which is so perverse as a result of Original Sin, recovers its tendency toward what is good. Prayer exercises a special influence over our emotions and feelings, for our uncontrolled passions are revealed in work. We recognize our faults in it: slowness, laziness, love of comfort, impatience, lack of endurance, fickleness, and so on. When these faults are subjected to the cleansing power of prayer, peace returns; we brace ourselves with Christian courage for the conquest of all opposition and hardship. It is not possible to do lasting, versatile, fruitful, and effective work without linking it with prayer. This is no small thing, for work-prayer is gratitude for the honor of our being called to cooperation with God; it is thanks for strength, health, the light of reason, wisdom, and the virtues and merits of the spirit that are drawn by our will into work. Only when we use these things in our work, as a musician uses the strings of his instrument, do we realize how great these gifts of God are. In work we see their usefulness; in work we recognize the value of the previous effort by which we acquired everything that we use today. Here the difference between virtue and imperfection can best be seen, between wisdom and knowledge on the one hand and ignorance on the other, between a strong and good will and the lack of will. A man endowed generously by God, a man who has put much fruitful effort into his life, who has prepared himself for work by appropriate improvement and education, now reaps the fruits of his toil and devotion. And if, through his whole previous life, he responded readily to God’s great graces, he enjoys the pleasures and results of his work all the more. When, in addition, we see around us people who are unable to work — people who are longing to give themselves up to work, but whose strength does not allow it — the feeling of gratitude for the possibility of and vocation to work increases in us. And thus a new good arises from our work: we see its worth, its usefulness. We see that the one Creator of all good is God. But we also see that, by the will of God, there is in almost every good a particle of recreative human work. Every good makes us rejoice. Every achievement, every fruit of work, brings with it a natural reward in the form of tremendous joy. The first feeling is gratitude to God, the turning of every fruit of work to the glory of God. “To the one God praise and glory” (cf. Ps. 95:7). “All ye works of the Lord, bless the Lord” (Ps. 144:10). Work is a sacrificial surrendering to God at His bidding and direction. We know from experience that there is always joy linked with this readiness and sacrifice, particularly when, in the middle of a host of commitments, additional work falls on us — proof, as it were, of the trust of others and of God in us. To accept this in all readiness, to guide it toward the heavenly Father, is to express oneself with one’s whole soul, a soul that is full of trust and loving prayer: “The Lord is my helper” (Ps. 117:6; Heb. 13:6). The raising up of the thought, will, and heart to God in heavy daily work — this is the most noble form of adoring God. All these thoughts go to create a whole system of the asceticism of work. Considered separately, they may seem to be something disconnected and artificial. They acquire their peculiar color and form, however, only when they are known through one’s own ex­perience. There will always be as many rich possibilities in the world as there are people and different kinds of work, as there are different stages of love and surrender to God. Every man can create, against the background of his own life, his own world of prayer in work; everyone solves this problem in a different way. For an understanding of prayer in work can be arrived at more by a life of work than by wordy discussions. Indeed, it is not words, but only work itself, based on the love of God, that instructs us as to how we ought to pray in work. Then the bidding “Pray and work” will cease to be simply a solemn command; then prayer will no longer be merely a supplement to work. Prayer transforms our work inwardly, and sanctifies it; and work widens the frontiers of prayer. Editor’s note: This article is from a chapter in Cardinal Wyszynski’s Sanctify Your Daily Life: How to Transform Work Into a Source of Strength, Holiness, and Joy, available in English from Sophia Institute Press.